As I’ve said before, purchases of securities by the FED amounts to the injection of counterfeit money into the economy under color of law. It’s bad enough when FED purchases are limited to federal government securities. In that case, it is federal budget deficits that are enabled. Now, the FED is buying, at inflated prices, “junk” (securities of little worth) from banks, financial institutions, and speculators, enriching those who caused the bubble in the first place, and enabling more of the same. This is just another move by the banking and financial elite to take ownership of the entire world. The significance of the Fed’s QE3 move therefore is there will continue to be free money in unlimited amounts to banks and investors to hoard or to speculate and play with, while it’s cuts in spending and disposable income for the rest of us. But ‘QEs for them’ and ‘Austerity for the rest of us’ will mean continued economic slowdown and recession, accelerating in Europe, more slowly coming in the US, and increasingly on the horizon for even Asia. That continued economic slowdown—in the US and globally—will make the private banking system in turn even more unstable, regardless of how many FED QEs are introduced. So why do governments continue with ‘austerity’ policies on the fiscal side that ultimately negate QE policies on the monetary side? Because QEs are more profitable to bankers and investors. And those bankers and investors believe if they can just hold out in the short run—with the government and central bank making up for their short term losses with trillions of ‘free money’ injections, in the longer run the capitalist system will self-correct itself on its own. But that proposition—i.e. bail out investors and bankers and let the markets do the rest—is economic ‘ideology’ and not economic fact or science. As governments, bankers, and financial elites continue to abuse the currency, the economy, and our political institutions, it becomes ever more urgent that people cooperate in organizing new structures of exchange and finance that empower them sufficiently to meet their basic needs and build “the Butterfly Society” to save the planet and provide a dignified life for everyone. — t.h.g. This entry was posted in Banking, Inflation, Politics, The Political Money System and tagged Ben Bernanke, inflation, quantitative easing. Bookmark the permalink. Thomas, many people are starting to advocate for “full reserve banking”. Even the IMF have been making a positive noise about it. This makes me think that it is a red herring, but I would like to have a better understanding of what are the true advantages / disadvantages for the people, relative to the banking system, in regard to full reserve banking. Is it just another way to maintain the status quo under the guise of “reform”? Thanks for any clarification. Will banks then serve only as “depositories” and not “banks of issue”? 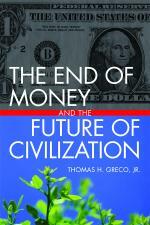 How will that move solve the problem of chronic budget deficits, monetization of government debts, and inflation?